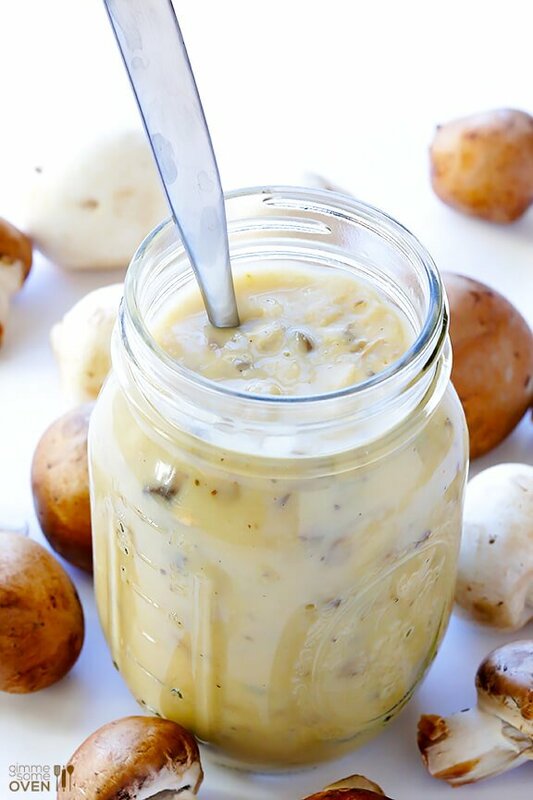 Alright, I couldn’t post about how to make homemade condensed cream of chicken soup without featuring its famous counterpart as well — condensed homemade cream of mushroom soup. I have to be honest though. As a kid, I detested mushrooms. Like, absolutely hated them. My mom loved them and occasionally tried to sneak some cream of mushroom soup into casseroles, but I would hunt down those pesky little fungi and push my plate away in protest. Me and mushrooms did not mix. But then one day in my early twenties, a good friend capitalized on my love of Mexican food and convinced me to try her portabello fajitas. And lo and behold, my anti-mushroom soapbox crumbled. And I’ve been eating and absolutely loving mushrooms ever since. 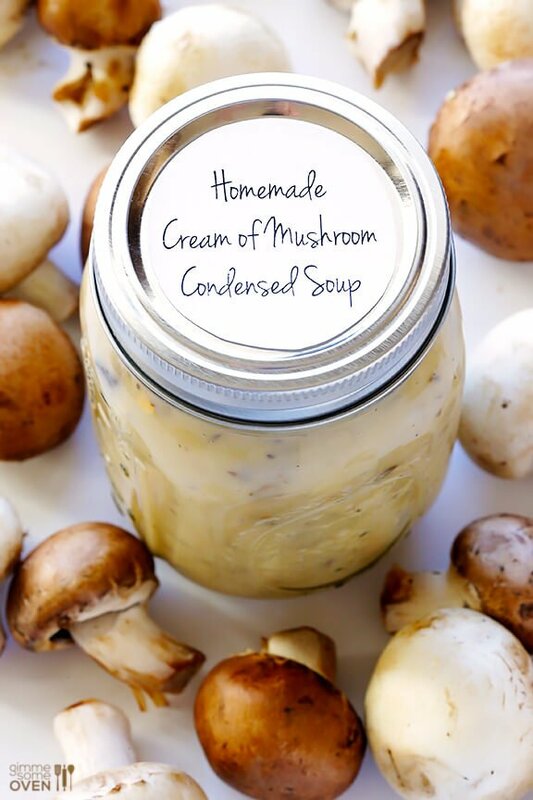 As with the recipe earlier this week for condensed cream of chicken soup, this condensed homemade cream of mushroom soup is SUPER easy to make. And as opposed to the famous stuff in the can, it’s preservative-free and made with normal, natural ingredients that you can actually pronounce and feel better about enjoying. But it still tastes and works in recipes just like the original stuff! (Or if you ask me, it tastes even better!) So bring on the soups, casseroles, scalloped potatoes, or whatever other recipes you like with the canned stuff. 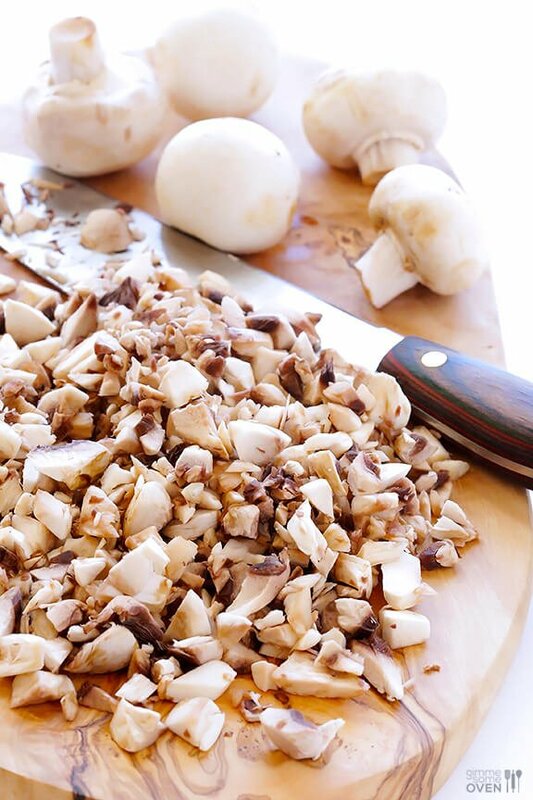 We begin with the most important ingredient — fresh mushrooms!! Really, you can use just about any kind of mushrooms in this recipe. I went with a mix of baby bella and white button mushrooms this time, and they worked perfectly. 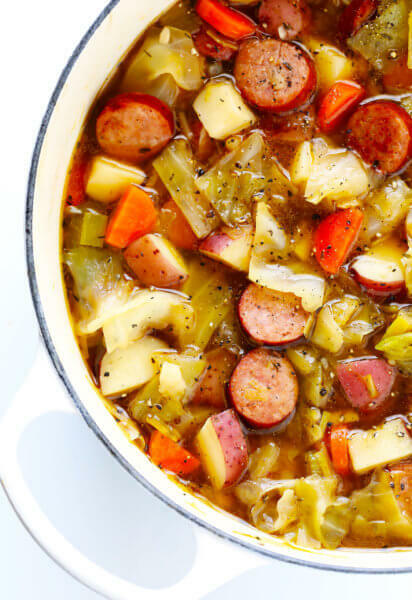 Bring some vegetable stock to a boil in a saucepan. (You can go homemade or store-bought.) Then whisk together some flour and milk in a separate bowl, and then add it to the boiling broth and stir to combine. The soup should thicken up pretty quickly. *Feel free to use your favorite kind of milk in this recipe, by the way. And gluten-free flour blends also work well. Add in some finely chopped mushrooms and seasonings, and let the mixture simmer for a few minutes to cook the mushrooms and the flour. Just be sure to stir it constantly so that the bottom of the pan does not burn. Yep, it really is that easy. 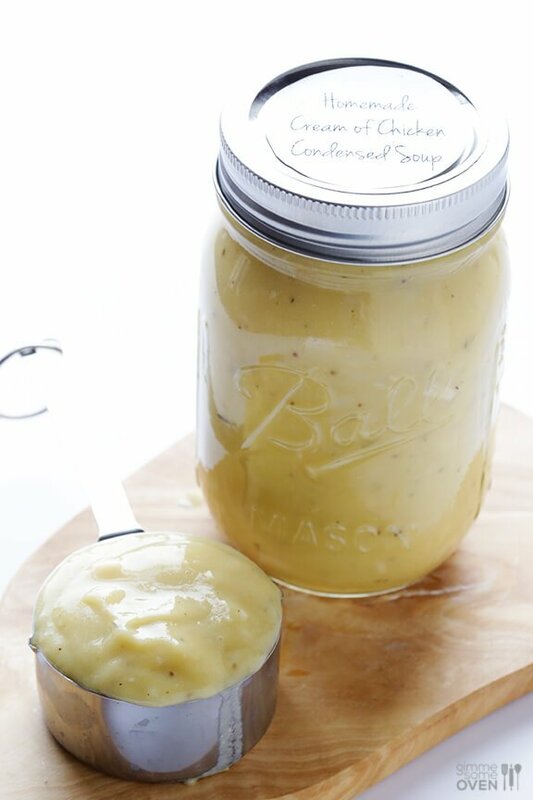 You can either use the condensed soup right away in a recipe, or pop it in a jar or airtight container to store in the refrigerator for up to 1 week. 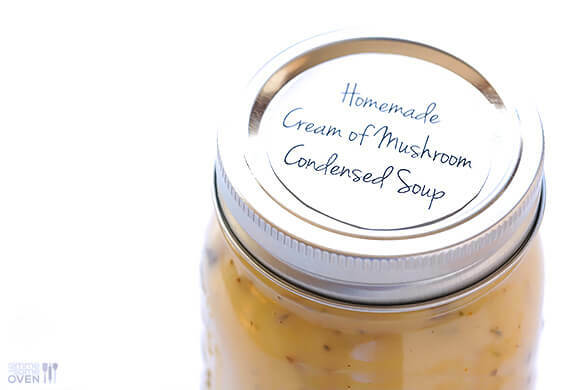 Sorry, I don’t recommend this recipe for canning or freezing — it is meant to be used fairly quickly and not stored. Also please note that this is a condensed soup and is not meant to be eaten plain. But adding it to a green bean casserole? Or some scalloped potatoes? Or even whisking it with equal parts milk to make a simple soup? Bring it on. Trust me, after you try this, you will happily bid farewell to those processed canned versions at the grocery store. Cheers to homemade! 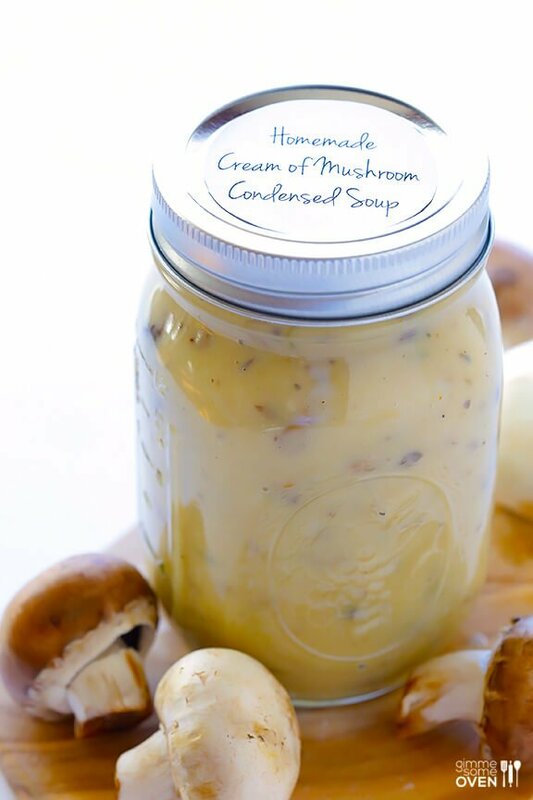 Condensed cream of mushroom soup is easy to make homemade, and you can feel better knowing what actually goes into it! Add vegetable stock to a large saucepan and bring to a boil over medium high heat. 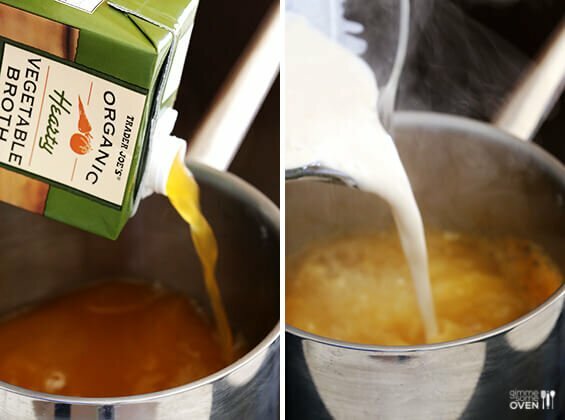 Slowly pour the milk mixture into the boiling vegetable stock, whisking to combine. Whisk in the mushrooms and remaining ingredients. Reduce heat to medium, and bring the mixture back to a very low boil, stirring constantly so that the bottom of the pan does not burn. Let the mixture boil for about 3 minutes or until thickened. Remove pan from heat. *Recipe very slightly adapted from Tammy’s Recipes and Pinch of Yum. (c) 2013 Gimme Some Oven. All rights reserved. Thank you!! I successfully made this recipe dairy free and gluten free!! I used almond milk (unsweetened, original) and Bob’s Red Mill 1 to 1 baking flour. I used the exact measurements, except I doubled them. It was thick and creamy and full of flavor! And so beyond easy!! I found your blog a few times on different recipes on pinterest and love the photos, recipes, and writing. This is the first thing I’ve made and YUM! I have FODMAP intolerances and I am still nursing my baby that has a severe milk protein allergy. I have eaten a paleo diet for a few years now, but will occasionally use gluten free flour mixes instead of almond flour because of my FODMAP issue. This year for thanksgiving dinner my husband requested green bean casserole like his mom used to make instead of my usual green bean cranberry almond balsamic dish. I thought, there is no way I am making that processed junk unless I can make it all natural and flavorful. Being raised on condensed processed food my hubby has been slow to come around to all natural cooking, because it’s not like his moms. Today I made the condensed cream of mushroom and my biggest critic actually liked it! He is really excited that I am making his favorite dish and can’t wait for tomorrow! Thank you again, I look forward to making more of your recipes. Yay, that’s awesome Brittany! Thanks so much for sharing with us – we’re especially happy to hear this was a hit with your husband! :) We hope you guys had a wonderful Thanksgiving! I love your recepies. They are very easy to make and absolutely delicious. Thank you very much for sharing. 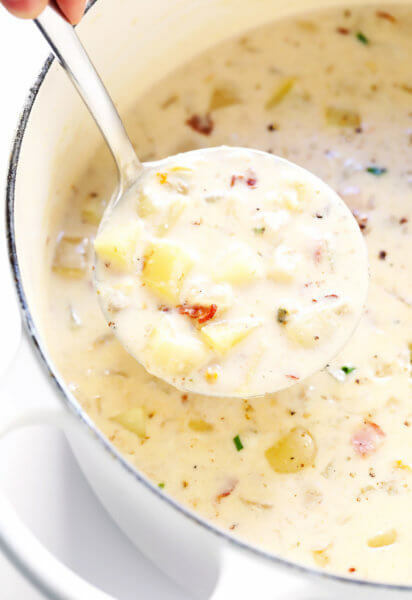 I have made large batches of this recipe and frozen in quart size bags (about 2 cans worth)…very handy for casseroles, pastas, etc! yum!! I found this recipe right before thanksgiving and it gave me SO much to be grateful for! My son and I are lactose intollerant (him more than me) so I was scrambling on how I could still let him enjoy green bean casserole. I found this recipe and just substituted lactose free milk and tada! And it was a hit with the ENTIRE family! I’m making it tonight to smother pork chops. I can not tell you how much I LOVE this recipe! Thank you! Also I did simmer half of the mushrooms in the broth to kind of bring out the flavor more. Either way its amazing. After cooled, can this be sealed in jar as in canning? Would love to make a large batch if I can. Thank you. Love your pins! Hi Traci! Hmmm, we’re not sure, as we haven’t tried that. However, this should last for about a week or so in the fridge, and you can also freeze it (should be good for about two months). We hope you enjoy! This was so easy and delicious. I forgot the cream of mushroom soup for my casserole. Looked up a DIY recipe. Found yours. Had everything for it. And Voila! Way better than the can! Of course! Everything is better homemade! 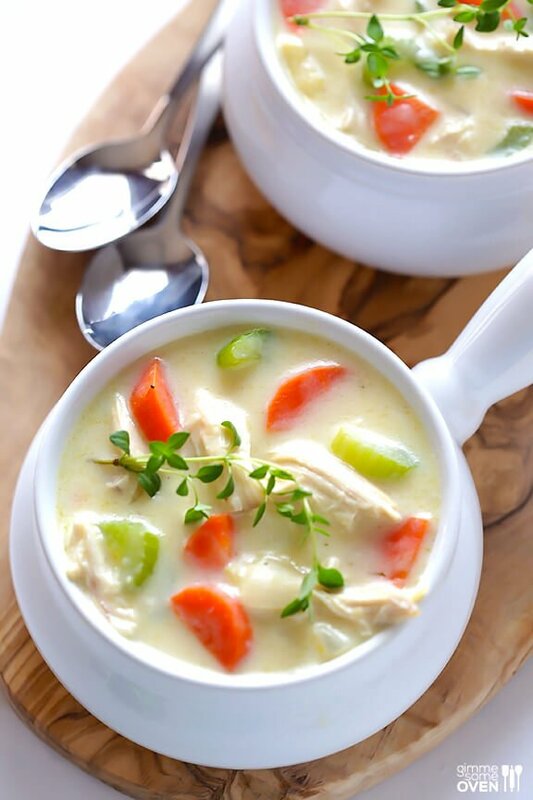 I made this tonight for my husband, it’s one of his favorite soups. He is on a strict low sodium diet and can soups are way too much. ..I just left the salt out and add 2tbls of unsalted butter and wolaa. ..he loves it. Thanks so much…I bookmarked the page so I can make it over and over. Awesome! This turned out great, even my anti-mushroom hubby liked it! Thanks for a great (and easy) home made recipe! 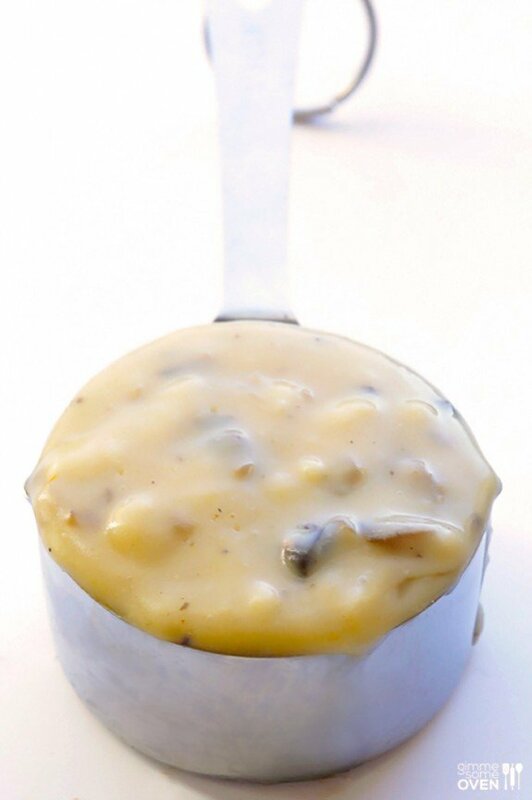 Hi Mary — we love using it in casseroles! Do you think that you could be canned? Hi Rachel! We haven’t tried canning this ourselves, so we’re not 100% sure, but we do know you can freeze it! We hope you enjoy! I am excited to find this recipe but I am not sure what I’m doing wrong. 2/3 cup milk to 1/3 cup flour turns into a paste. It seems to be too much flour??? What am I doing wrong? Hi Jennifer — hmmmm those amounts should whisk well together and the flour should dissolve. How did it turn out? Thanks, Wanita — we hope you enjoy! 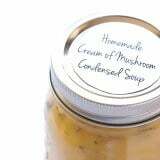 Unfortunately we don’t have much knowledge/expertise on canning, but we believe you’ll need a pressure canner to can this (and other cream/butter-based soups). This might be helpful to you. Sorry we aren’t able to offer more insight! Your recipe says it is not good for freezing. 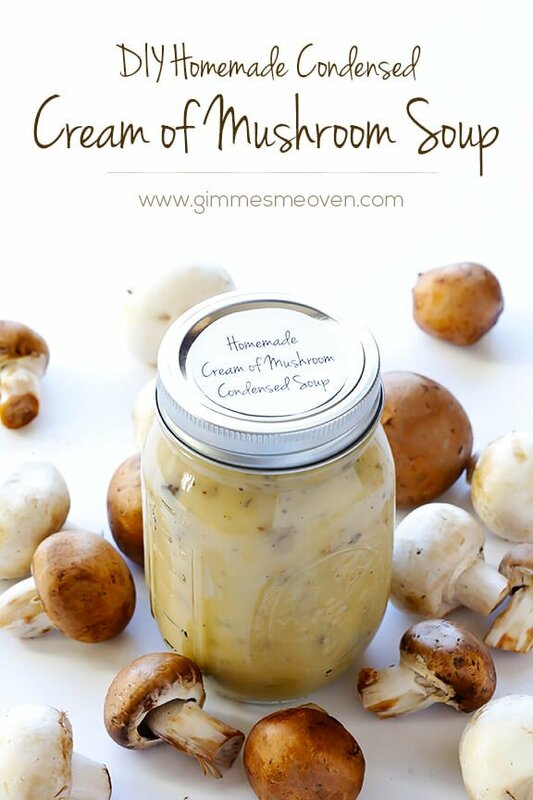 I have a casserole recipe that calls for a can of cream of mushroom soup mixed in. I usually make it as a freezer meal. Would it be okay frozen that way? Yes, we think if it’s baked into a casserole and then frozen, that should be fine. We hope you enjoy! Just moved to the west coast over a week ago. We went on a fungi foraging class on sunday, and came out with a huge load of Candy Caps–wanted to make a superb tuna casserole and this recipe was just the thing. I’ll never buy condensed soup again! Thank you for the great work, and making the internet a MUCH better place! Amazingly easy and delicious! I will NEVER buy canned cream of gross again! Took me 20 min tops to make. Thank you thank you!!!!! What are other spices I can use in this soup instead of thyme? I’m not a fan of thyme. If you make the soup omitting the milk and flour, you can pressure can this easily enough. Then when needed, heat it up, add the mixture of milk and flour, and proceed with thickening instructions. 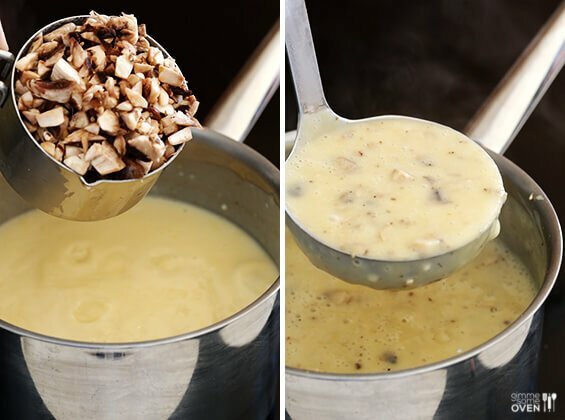 Can you roast or saute the mushrooms & some garlic before adding it to the cream soup mixture? Love your recipes! Thanks for posting This! 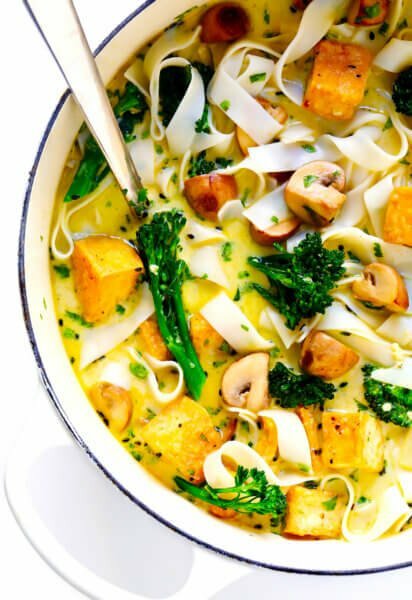 I’m seeing a recipe for Instant Pot butternut squash soup, so it made me wonder if I could make this in my Instant pot? Have you tried it in there? I was wondering if you could possibly can this recipe. Have you ever tried?